Speaker of the House Nancy Pelosi has an incredible message for her Democratic colleagues: Support health care even if it costs them their seat in Congress. Appearing Sunday on ABC’s “This Week” news talk program, Pelosi said health care is too important to play it safe politically. “We’re not here just to self-perpetuate our service in Congress. We’re here to do the job for the American people,” Pelosi said. Pelosi’s ultimatum is not likely to sit well with Democrats facing tough re-election campaigns in an election year when polls show most Americans don’t care for the so-called “reform” packages currently before Congress. Moderate Democrats have come under fire from constituents over the massive, expensive health care “reform” bills in both the House and Senate. Polls show most Americans don’t support the legislation and recent gains by Republicans in special elections have Democrats nervous. I’ve often mentioned I study photo’s supplied with articles. Every time I study her eyes I get a yellow to red flag alert there’s something wrong with her “chemically speaking”. It’s too bad our Congressmen/women can’t be forced to take a drug test just as many Americans in the work place. This should go for the Executive and Judicial branch too. Americans should be thoroughly fed up with suffering under nightmarish corporate schemes to monitor workers for drug abuse, but we must unquestioningly suffer the crap legislation that these seemingly madmen and women crank out of the House and Senate 24/7/365. Are they clean? Are they banging on all cylinders? I seriously doubt so. Bogofree – Try about 250 congressional members turned lobbyists.. Plus there was a report the other day that for every Congressional member there are 8 lobbyists who represent insurance companies and medical provider groups…and pharm companies. I support health care reform….I just don’t support bad health care reform. How many former members of Congress are now lobbyist? I had read it is well over a 100. Is that correct? Nancy why wait to loose your position do the American voter a favor and QUIT NOW save FACE. Richard, have you seen that face? there is nothing to save. She has had it pulled so far back that she can’t close her lips. She reminds me of the bug in an Edgar suit from Men in Black. We’re fish in a barrel, folks, fish in a barrel. Remember…they are only doing what the majority of Americans want. If you don’t believe it…ask any politician from any state and district. Oh wait. You’ll have to get in line behind the dozens of lobbyists who are piece-milling the contents of the next Bill that will remove your right to stand in line. Is this part of what the Council on Foreign Relations has told Hillary Clinton and other government officials to do? 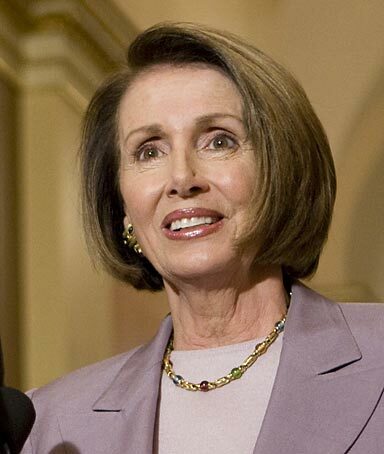 Just what is the plan here Nancy? These bills as they stand do not reform health care, but criminalize not having insurance for health care and surely they all know it. Do they know how to suddenly grow spines? Will they do what their constituents want and need? Dear Nancy now requests that all join her in singing Sympathy for the Devil by the Rolling Stones while she and her ilk from the dank cellars of greed oil the hinges of hell with our blood and prosperity. All hail the new Queen of the dark minions as she directs them to fall upon their golden diamond studded swords. Hack.. I agree with griff and will add that If she loses her election, she will be a lobbyist quickly for the Insurance and Pharma corporations. Accepting money from the Lobbyists is now legal and will keep the Congress in all the money possible. I do not blame the Lobbyists as much as the Congress and people like Speaker Nancy Pelosi. But griff, it is the voters who put these people in office and we will continue to do so until our elections are redundant. Ethics begins locally and in both parties. I asked on another thread whether Charlie Rangel will be reelected next year. If he is, voting will be reduncant. Integrity is a lost talent. I see no reason to encourage any politician. The voters are content with whining…..
Every one knows that you’ll be back in Washington working for the very institutions that have written this abominable legislation should you find yourselves out of a job come fall. Spare us the selfless saintly act – we’re not all idiots yet.